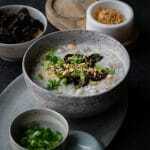 Vietnamese fish congee (also called “Chao ca”) is so flavorful and comforting. Making it in a pressure cooker is super easy and cuts down cooking time significantly. 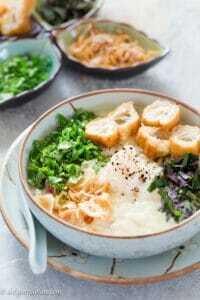 A few days ago, I wrote an overview of Vietnamese rice porridge and different ways to customize it to your liking. Today, I will share with you my favorite way to cook fish congee. It’s actually very common in Vietnam to make rice porridge with seafood. Some of the popular ones are clam porridge, fish porridge, geoduck porridge and lobster porridge. I love the fact that each type of seafood gives the rice porridge a distinct flavor. The truth is I didn’t like fish congee when I was a kid. No, it wasn’t because of how it tasted. Instead, it was because my family ate it so frequently that I got fed up with eating it again and again. Now when I’m older, a little wiser and more importantly live inland where seafood is not as abundant as in my hometown, I really appreciate how delicious and comforting fish congee is. The main ingredients are rice, water, fish fillet and fish scraps (like head, tail and/or bones). To infuse the rice porridge with flavors of the sea, you need more than just fish fillet. You can use whole fish (and then separate into head, tail and fillet) or just fish bones and fillet. In my case, I use a 1 lb to 1.5 lb red snapper bone piece. If you can’t buy fish scraps, it’s okay to use pork or chicken stock but the congee will have less fish flavor. Quick update on 2/21/19: I just made this congee again today with grouper fish steaks instead of using a combination of fish scraps and fish fillet. It turned out delicious and I even used frozen fish steaks. I added notes to the recipe card for using fish steaks. Below is a photo of the fish congee I cooked today. For the fish fillet, our favorite pick is grouper. Grouper is lean with a firm texture while being moist when cooked. Its cooked flesh is white, and though it is mild, the flavor is unique with a subtle sweetness. The taste is somewhat like a combination of sea bass and halibut. The whole grouper sold at my grocery store is much bigger than the one in Vietnam but they taste almost the same. I’m not sure about the availability of grouper in other cities in the U.S. and other countries. My grocery store always has it for sale. If you can’t find it, some other great types of fish are barramundi, halibut and bass. I also want to mention that grouper is perfect for Vietnamese fried fish noodle soup, and in fact it is the fish my mom uses at home for that dish. Let’s move on to the next ingredient (sorry I always get excited when talking about fish). I use Japanese short grain rice to get a creamy texture for the porridge, but it’s not the only way to do it. 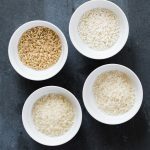 You can refer to my previous post to see how you can play with different types of rice to cook congee. I also use a couple tablespoons of mung bean to add just a little bit of a wholesome taste. Restaurants in my hometown usually add a small amount of mung bean to fish porridge and lobster porridge but it is totally optional. is one of the most frequently used items in my kitchen. It is a multi-cooker that can function as a pressure cooker, a slow cooker and more. When making rice porridge in a pressure cooker, you don’t need to soak rice in water and don’t need to make broth in advance. All ingredients (rice, mung bean, fish bones, aromatics, and seasoning) go straight into the pressure cooker. You cook it with high pressure for 15 minutes. Then if you use an Instant Pot, switch it to Sauté, add thin slices of fish fillet, cook for a few more minutes, adjust the consistency and seasoning of the congee then serve. If you just have a regular pressure cooker, transfer everything to a pot and do the final steps on the stovetop. Either way, a steamy and delicious bowl of fish congee will be ready in 30 minutes. 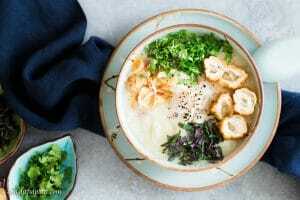 My overview of rice porridge post has a small section about different types of toppings and herbs for congee. For fish congee, I recommend fried shallot, Chinese crullers, scallion, cilantro and Vietnamese perilla (tia to). 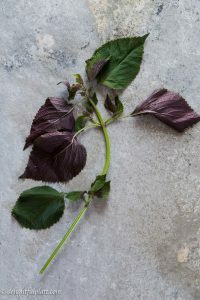 Vietnamese perilla is a herb with leaves having green color on one side and purple color on the other side. Its strong and bold flavor complements seafood especially fish wonderfully. I’d love to hear what you think about the dish, so please feel free to leave a comment. You can find my collection of Vietnamese recipes here. New recipes are added every week so let’s connect on Facebook, Pinterest and Instagram for the latest updates. 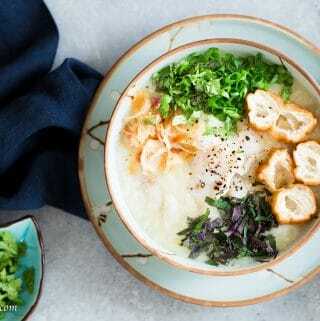 Vietnamese fish congee (rice porridge) is so flavorful and comforting. Making it in a pressure cooker is super easy and cuts down cooking time significantly. A steamy and delicious bowl of fish congee will be ready in just 30 minutes. Wash rice and mung bean (if using) and drain, add to the pressure cooker. Scrub fish bones with salt and rinse under cold water. Add to the pressure cooker. Peel and slice ginger into thin slices. Peel and cut shallot in half. Place in the pressure cooker. Add water and 1 teaspoon salt to the pressure cooker too. Cook on high pressure for 12 minutes (you can also select Porridge mode if using Instant Pot). While the congee is cooked in the pressure cooker, slice fish fillet on the diagonal into 1/2 in thick pieces. Season with a pinch of salt and pepper, set aside. Once the pressure cooking is over and the pressure has been naturally released, remove and discard the fish bones. If using an Instant Pot, switch to Sauté mode, add fish fillet slices. Cook for a couple minutes or until fish is fully cooked. Check consistency, if it's too thick, add some more water. If it's too thin, simmer a little more. Add 1 tablespoon of fish sauce and adjust seasoning to your liking. Transfer congee to serving bowl and add toppings and herbs of your choice. 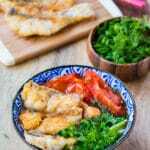 If you cannot buy fish scraps, you can use 1.5 - 2 lbs of fish steaks instead of using a combination of fish scraps and fish fillet. Grouper fish steaks work best. If using fresh fish steaks, cook with high pressure for 10 minutes and let pressure release naturally all the way or for at least 10-15 minutes and then release slowly. If using frozen fish steaks, cook with high pressure for 12 minutes. Also let pressure release naturally. After that, remove the fish bones, break the fish into smaller chunks. Season the congee to your liking, ladle into serving bowls and enjoy. It's best to use short grain white rice such as Japanese rice for a creamy and silky texture. Or you can use a combination of jasmine rice and sticky rice. Besides grouper, you can use other firm and meaty white fish such as halibut and barramundi. Fried shallot, Chinese crullers and Vietnamese perilla can be bought at Asian grocery stores. Trying this tonight! I have head, bones, and meat of fish… should I clean out certain parts of the head first? Hi Maya! I’m sorry for my late reply. I was traveling during the last couple weeks. I would get rid of the fish gills, and then rub with salt and rinse thoroughly under water. If it’s a large head, I would split it before rubbing salt and rinsing. I hope that helps and sorry again for my late reply. Thanks so much for commenting! Hello there. Love your blog! Just a quick one really: can you really, honestly cook congee in half an hour wth a pressure cooker? Hello! Thank you for leaving me a comment! Yes, it’s really possible to cook congee in half an hour with a pressure cooker. The amount of time may need to be increased depending on what you put in the pressure cooker with rice (for example: a whole chicken vs ground pork). I’ve made fish congee, chicken congee and duck congee with a pressure cooker. I also find that it’s better to use starchy rice like using Japanese short grain white rice or mixing in some sticky rice to get a good consistency as if we cooked it on the stovetop. Also, if you add boiling water, it will help decreasing time to build up the pressure. Making congee in a pressure cooker often takes 20-30 minutes after building up pressure. I was also skeptical when my mom first showed me how to cook congee with a pressure cooker. If you have a chance, I think you should give it a try and experiment with cooking time and different rice :). Glad to see you again :)! I had no idea it could take months to order and receive an Instant Pot in the UK. When I studied in the UK about 6 years ago, a pressure cooker didn’t seem to be a popular item at all. I’m happy to hear that you enjoyed using it :).